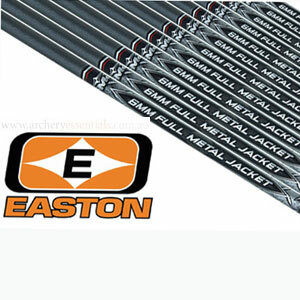 Easton FMJ 6mm shafts are built on the shoulders of the legendary Full Metal Jacket, Easton's all new FMJ 6mm takes aluminium carbon composite arrow lethality to new heights. Perfect for any hunter looking to squeeze that last ounce of KE out of their hunting bow, the FMJ 6mm features improved sectional density and lower surface area to get even more power behind the point. The Full Metal Jacket 6mm is sure to set new standards for performance and penetration.